Turmeric is one of nature’s most powerful healers. The active ingredient in turmeric is curcumin. 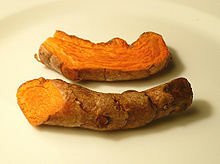 Tumeric has been used for over 2500 years in India. It appears that curcumins anti-inflammatory properties help fight a range of health problems, including arthritis and bowel conditions like Crohn’s disease. Research has suggested it could help in the fight against Alzheimers after tests showed build-up of plaques in the brain had halved and there was less inflammation in the brain tissue. From Wikipedia : Turmeric is currently being investigated for possible benefits in Alzheimer’s disease, cancer, arthritis, and other clinical disorders. New research suggests that a compound found in turmeric (a key ingredient in curry) may help protect against liver damage. In their study on mice, scientists determined that the compound known as curcumin may help lessen the inflammation linked to cirrhosis (a potentially fatal disease marked by scarring of the liver). For the study, researchers focused on mice with chronic liver inflammation. After following a curcumin-enhanced diet for four or eight weeks, the mice experienced a significant reduction in liver cell damage and scarring. It’s likely that these benefits stem from curcumin’s ability to curb inflammation, according to the study’s authors.